Halfway to the Red Planet, an explosion leaves the four-member crew of the Ares 10 with only enough oxygen for one. Valkerie Jansen, the ship’s doctor, is tough, beautiful, and has an uncanny knack for survival. Bob Kaganovski, the ship’s mechanic, is paid to be paranoid — and he’s good at it. He’s worried that Valkerie is mentally unbalanced, possibly even dangerous. Which is just too bad, because Bob’s falling in love with her. Meanwhile, NASA is trying to figure out who should live and who should die, when there’s only enough oxygen for one. I’m a big fan of sci-fi films and TV shows, but as I read over the blurb for Oxygen, I realised I hardly ever read sci-fi books. The cover certainly attracts attention, and I like the space age typography effect, but would this book be able to tip the scales from TV to eBook? Bob Kaganovski had shampoo in his eyes when the decompression alarm went off. He grabbed the suction hose and ran it frantically over his face and eyes. Footsteps pounded outside the shower. Bob popped open the Velcroed shower door and grabbed a towel. Fear knotted his gut. Only fifteen minutes! He stepped out of the shower and swiped a towel across the soles of his feet, drying them just enough so he wouldn’t kill himself on the stairs. He ran through a corridor to the steep circular stairway that led down to Level 1 of the Habitation Module. The decompression alarm beeped once every two seconds. The interval was keyed to cabin pressure. When it got down to vacuum, the beeps would merge into one steady drone. If he wasn’t in his suit by then, he wouldn’t hear it. For one thing, sound wouldn’t travel in a vacuum. For another, he’d be dead. Four NASA astronauts are set to be the first humans to set foot on Mars. A suspicious explosion cripples their spaceship, leaving only enough oxygen for one of them to survive. Oxygen is a tense near future science fiction thriller exploring themes of friendship, trust, loneliness, faith and science. What’s good about this book? First, the characters. The lead characters of Valkerie Jansen and Bob Kaganovski are realistic and larger than life. As they journeyed together through space, I became increasingly attached to them, and I would find myself pondering their fate even when I wasn’t reading the book. It’s a couple of weeks since I finished reading Oxygen, and I’ve continued thinking about Bob and Valkyrie – which is unusual for me. Second, the storyline. Ingermanson and Olson start as they intend to continue – at breakneck pace, with nail biting tension. There are constant twists and surprises that keep you turning the page and wondering “how are they ever going to get out of this mess?” The ending was a wonderful surprise and yet, once it happened, it seemed inevitable. Third, the detail. This is clearly a well-researched novel, and both authors are professional scientists. Their intricate knowledge of space travel is used to add relevant plot twists, yet I was never overwhelmed with technological details. In summary, this is a tense thriller exploring deep questions. I enjoy reading thrillers by John Grisham and Hal Coben, and I enjoyed Oxygen just as much as any book by these authors. The book has a whopping 628 pages, and the Kindle price is £3.26. There are 10 reviews on Amazon.co.uk, all of them four and five stars, and 148 on Amazon.com, 65% of them are five stars. I have read Randy Ingermanson’s, How to Write a Novel using the Snowflake Method after it was recommended to me, and I do like his style of writing. I have yet to read any of his fiction work. With Christmas just around the corner, and a hefty work load, I know that I won’t be able to read this until next year so I will pass today, but I am going to put Oxygen on my BUY list in the future. 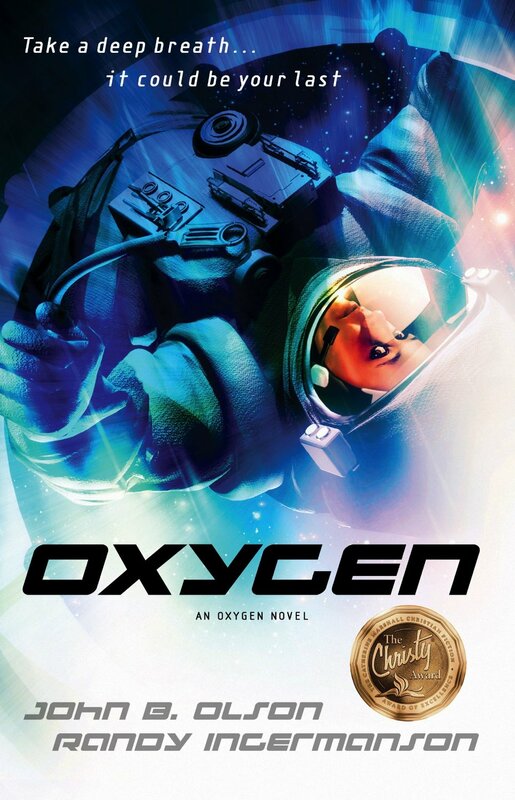 Oxygen – buy your copy. I listened to The Martian and loved it. I might not have enjoyed it so much reading, it does get quite technical in parts. I’ll look out for this on Audible, it does sound good. My dad has just finished reading The Martian and he loved it. I never thought about getting the audio version, what a great idea. The narrator is really good, I’ve listened to several books he’s narrated. I’m like you I watch sci-fi, I love Stargate, but I rarely read it. I’m not so sure about the cover, I had to peer at it to see the astronaut. Not a book I’d jump to read at the moment.